NETWORK UPDATE: SUNDAY NIGHT FOOTBALL adjusted up to 6.3 in final numbers, down 0.7 from last week’s final (which was down 1.4 from the final before that). There was no change to the 3.5 for the AMERICAN MUSIC AWARDS, and no adjustments anywhere else. CABLE HIGHLIGHTS: Not great news at AMC, where despite a 0.14 rise for THE WALKING DEAD (to 6.65), the 2d airing of INTO THE BADLANDS fell a scary 0.88 to 2.27, sliding from 2.89 to 1.97 in the course of its hour. That’s still a very big number, of course, and the show is far from dead at a network that recently renewed the low rated TURN and HALT AND CATCH FIRE, but it raises doubts about BADLANDS’ ability to do much in a timeslot without its massive lead-in. (FYI, BETTER CALL SAUL only aired once after WALKING DEAD, dropping from 3.43 to 1.63 when it made the move to Monday.) 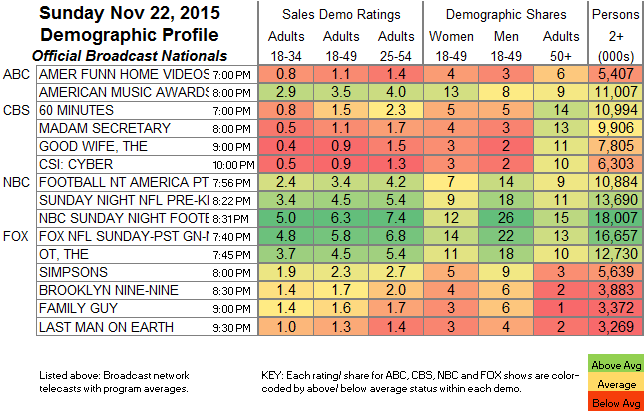 TALKING DEAD was very stable despite its own lower lead-in, down 0.07 to 1.51. Bravo’s REAL HOUSEWIVES OF ATLANTA dropped 0.24 to 1.19, with lead-out REAL HOUSEWIVES OF BEVERLY HILLS at 0.59. A Disney Channel LION GUARD special was at 1.06. 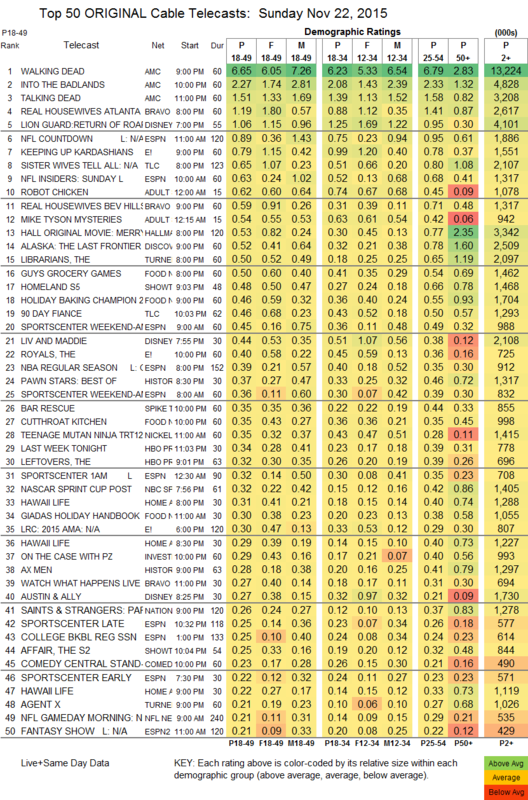 On E!, KEEPING UP WITH THE KARDASHIANS plunged 0.48 to 0.79, and given that fact, lead-out THE ROYALS held astonishingly well, down 0.01 to 0.40. On TLC, a SISTER WIVES TELL ALL special was at 0.65, 0.04 below last week’s regular episode. Adult Swim’s ROBOT CHICKEN slipped 0.03 to 0.62, and MIKE TYSON MYSTERIES ticked up to 0.54. Hallmark’s MERRY MATRIMONY holiday movie was at 0.53. Discovery’s ALASKA: THE LAST FRONTIER was at 0.52. On TNT, THE LIBRARIANS rose 0.05 to 0.50, while AGENT X edged up 0.02 to 0.21. On Food Network, GUY’S GROCERY GAMES climbed 0.13 to 0.50, HOLIDAY BAKING CHAMPION downticked to 0.46, and CUTTHROAT KITCHEN fell 0.05 to 0.35. Spike’s BAR RESCUE fell 0.17 to 0.35. Logo’s RUPAUL’S DRAG RACE was at 0.03/66K. Among the pay networks, Showtime was again the leader, with HOMELAND up 0.08 to 0.48 and THE AFFAIR up 0.05 to 0.25. At HBO, THE LEFTOVERS rose 0.04 to 0.32, GETTING ON was steady at 0.06, and the last 2015 episode of LAST WEEK TONIGHT gained 0.04 to 0.34. Starz’s FLESH AND BONE narrowly missed the Top 150 chart, up 0.01 to 0.05/130K.